Here is a project from the fall of 08. I built this ramp for my friend's 4 year old. I've got more pictures and info. It was designed from ideas from several ramps. Some from this sight and various other places. More info later, feel free to send questions and comments. Start 'em young!! 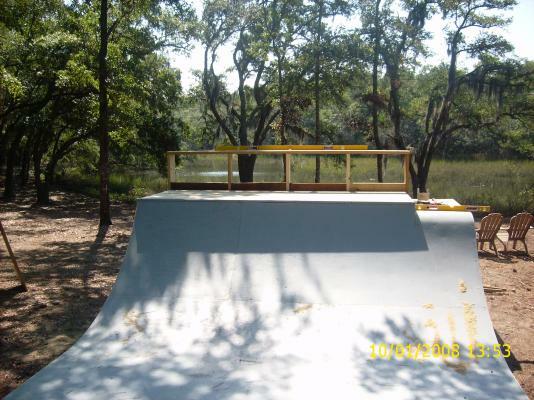 This is a 3'8" halfpipe, double sheeted with 3/8's inch ply and bolted together in three sections for easier relocation. It was built in the marsh on a barrier island in SC. I built the ramp on my friend's property for his 4 year old son and friends. I have more pictures and info coming later, but here's a glimpse. Questions and comments are welcome. Ideas and building techniques came from this sight and various other minds and places. It's all 'bout the young 'uns! !